1. I find the above pic so hilarious, I almost don't want to write a Monday list because what could possibly top that? 2. 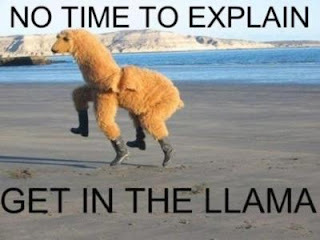 Side note: I totally need a llama costume. 3. I don't care how mortified my kids would be. 4. My birthday was January 8th. Since I don't mind aging at all, I will freely admit to turning 38. 5. I don't think that's old. I don't feel old. I don't act old. 6. But ... as much as I don't mind aging, I don't feel a need to rush the process either. 7. So when my parents inexplicably received a letter from the AARP addressed to me and decided the best way to handle it was to bring it with them when they visited in December so they could hand deliver it, I didn't appreciate it. 8. I mean, I'm all about getting a senior discount at the local Bed, Bath and Beyond, but at least wait until I'm hovering just under 50 before you put me on your mailing list..
9. But if my parents found it hilarious that their daughter was now on the AARP mailing list (And really? If they pause to think about that long enough, I think the joke will be on them ...), my husband nearly died of laughter. 10. Don't worry. It won't be laughter that kills him. 11. I'd like to elaborate on the above statement a little more, but one day I may need plausible deniability in court. 12. Because not only did my hubby laugh himself silly over the fact that even though he's older than me, he's yet to land on the AARP's radar, he made a grave error on my birthday. 13. Starshine asked him how old I was, and my dear, loving husband looked me in the eye and said "Some people call her the Ancient of Days." 14. I said "Some people call you dead. I can make sure they aren't lying." 15. But of course, I need time to make it look like an accident. 16. I received some fun and totally perfect for me gifts from my family: A squishable zombie whose brains leak out when you squeeze him (I KNOW!! So awesome. ), a bumper sticker with an attacking kitten that says "Release the Kraken!," a Harry Potter chess set, a lovely scarf, and a plaque that says #1 Mom and Writer (Which my hubby had made for me and which definitely helped save his life.). 17. But the gifts I want to discuss are the ones my friends and family kept suggesting as the most appropriate for me. 20. A cell phone pouch to wear around my neck so that my hubby and Myra don't have to keep having conniption fits every time they try to call me and my phone is somewhere I'm not. 21. I can't really argue with the necessity of any of these. I can't keep track of how many head injuries I've had, I don't think there's anyone else on the Internet who has admitted to accidentally snorting more things than me, and it's true I hardly ever know where my cell phone is. The one time I tried to follow Clint's (and Myra's) instructions and carry it around in my pocket all day, it fell out and landed in the dryer. 22. Thankfully, I saw it before I turned the dryer on. But what if next time it falls in the oven? Or the bathtub? OR THE TOILET? 23. With my luck, it would fall in an automatically flushing toilet and that would be the end of it. 24. My sister has decided the answer to all of these is to wrap me up in bubble wrap, thus protecting my head and securing my phone to my person at all times. 25. Myra has offered to Bedazzle a helmet for me. 26. Jodi and her husband are pretty convinced anything that comes near me will get snorted one way or another. Including bubble wrap. 27. In fact, when my car died by the side of the road in December, Jodi said to her hubby "Guess what happened to C.J. 's car today?" 27. And he replied "It went up her nose?" 28. I'm going to eschew the helmet idea (Can we say flat hair?? ), nix the nose plug (I'd probably just get it stuck in one of my nostrils anyway. ), and make my hubby put down in writing that the chances of me losing the phone pouch are 99 to 1 and he knows that going into it. 29. And then I'm going to get a t-shirt made that says "It's Part of my Charm." 30. One of these days, my friends and family will just learn to accept that. Old is just a state of mind, but wow. I would probably be offended by that too, and I'm almost as young as you. Hey, take the AARP card as soon as you can get it. GREAT discounts on hotels and car rentals AND everyone tells you how young you look. Don't feel too bad, CJ - I'm 24 and occasionally get mail from the AARP. This may have something to do with my terrible arthritis, and if I had a lawn I'd totally chase kids off of it, but... you know. I adore you so much! Instead of a full llama costume, maybe you could do a fabulous mask ala Lion King. BTW AARP is relentless. Once your on their list they dig in and bombard you. Thanks for the giggles. Mom and I have been using dad's AARP discount card for decades...even on the mile of bubble wrap I just got for you. I love the llama costume that is too funny. It's the llame picture!!! & you picked an excellent day to write this post! I didn't know you had a January birthday! That makes you even cooler! As always, fabulous post! I love it! This time, the laughing didn't threaten to kill me.